DENVER — A few hours before he hit the longest home run at Coors Field this season, Ian Desmond was talking about factory settings. You know, like factory settings on your computer. “It was about resetting back to my swing that I had since I was in my young 20’s — even before that,” Desmond said of his recent resurgence. The Rockies first baseman/left fielder is hitting .288/.387/.540 with 10 home runs since May 27. In the 50 games before that, he was slashing .173/.224/.358 with eight homers. 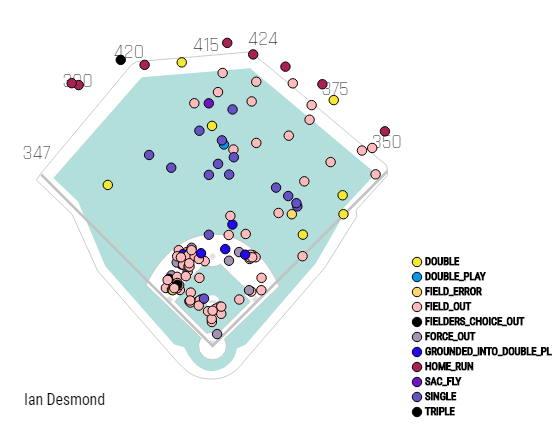 Prior to May 27, Desmond’s hard-hit rate per Statcast (percentage of batted balls with exit velocity of 95 mph or greater) was 37.2 percent. Since, it’s jumped to 47 percent. Like a computer that had been infected with malware, Desmond’s operating system at the plate was haywire after he made what he calls a “conscious effort to make a change” following an injury-plagued 2017 campaign in which his ground ball rate soared from 53.4 percent the previous year with the Rangers to 62.7 percent in his first season with Colorado. Things only got worse for Desmond early on this season, as the ground ball rate actually increased while his OPS decreased dramatically from 2017 (from .701 last season to .582 through May 26 of this season). “I decided to go back to doing what I was doing, kind of giving up on the experiment,” Desmond said. The experiment, at least in part, involved the height and angle of Desmond’s hands as he awaited each pitch. The launch angle revolution is real, and changing the angle at which the baseball comes off the bat has certainly helped many players improve and even resurrect their careers. But it’s not for everyone. It doesn’t appear to be for Desmond, though he could’ve fooled us on his mammoth 472-foot home run onto the concourse beyond the left-field seats at Coors Field during Wednesday night’s 19-2 Rockies rout of the D-backs. When the Rockies signed Desmond to a five-year, $70 million contract during the 2016 Winter Meetings, he was coming off a season with Texas in which he posted a 103 OPS+ and 22 homers as a center fielder. He was two years removed from a three-season stretch over which his OPS+ was 113, solid for a shortstop’s batting profile. 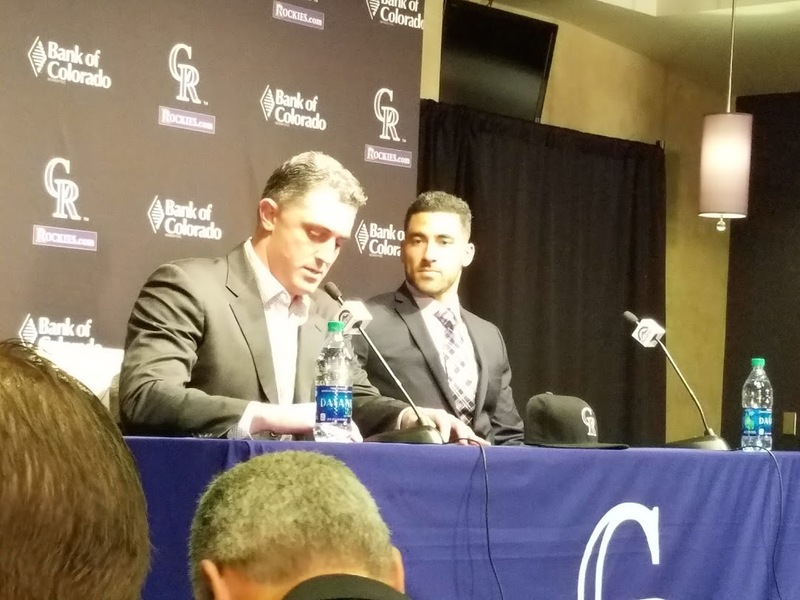 Rockies general manager Jeff Bridich introduces Ian Desmond, whom Colorado signed to a five-year, $70 million contract in December 2016. 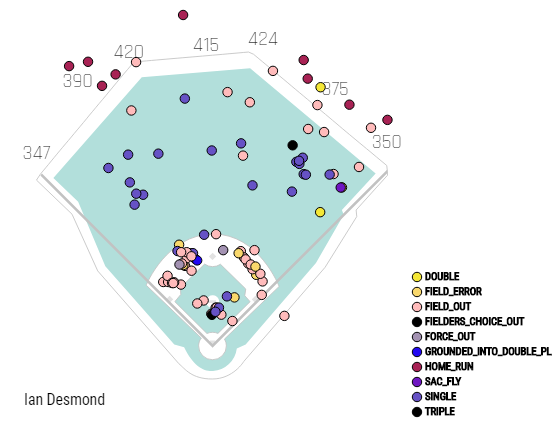 With the size of the investment in Desmond and his struggles in a Rockies uniform, there were boos at Coors Field following his plate appearances, particularly after yet another ground ball chopped to shortstop with men in scoring position. Desmond has a Twitter account. But he doesn’t often spend time there. In fact, he makes it a point to stay off of social media as much as possible. Still, in today’s world, how can you not hear the noise? The Rockies, currently 2 1/2 games back of first place in the National League West after being as many as 8 games back just two weeks ago, will need Desmond to continue producing. The entire lineup has been better of late, as has been the starting pitching and — a hiccup Tuesday against the division-leading D-backs not withstanding — even the bullpen. Desmond has been one of the leaders of the offensive awakening. His weighted on-base average since May 27 is .395, third behind only the red-hot Trevor Story (.421) and Nolan Arenado (.420). In terms of expected wOBA per Statcast (based on launch angle and exit velocity of batted balls, plus real-world strikeouts and walks), Desmond has actually been better than Story: .370 to .357. If the Rockies do reach the postseason for the second consecutive season, one of the concepts they’ll have to thank is the restoration of factory settings — baseball edition. Desmond paid dearly. Now his return to what worked before is paying dividends.